Since my return from Canada, it was been pretty warm in the Scottish mountains. Unfortunately I’ve either been working (too much for my liking) or the conditions have been too poor to get much mixed climbing done. I have been managing to keep up my psyche and my new found Canadian fitness with multiple sessions in my small training gym at home. This kept me fit and ready to pounce as soon as the conditions reappeared in the mountains, which they did this past weekend. On Saturday morning, Dougie and I headed North in search of some tasty mixed action. We were a little sceptical, as the forecast was not the best and it was due to get super warm throughout the day. 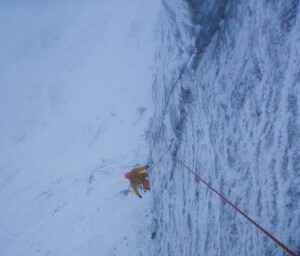 But we headed up anyway with some conditions beta from Will Sim who had been out the previous day. We had a few plans in mind, but were holding off until we could see what was in condition in the coire before we got set on anything in particular. As the buttresses came into view it soon became apparent that everything was up for grabs. 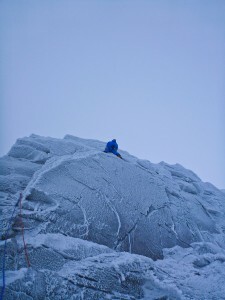 All the rock was plastered white and there was a proper wintery vibe of, frozen belayers waiting patiently for their partners to gain height on their chosen routes, and the sound of gear and axes jingling around the coire as people sorted out racks and ropes. We decided on plan A, which swiftly got put to one side and we headed for plan B, and plan B was good! We headed over to the steep and imposing Happy Tyrolean’s wall, which despite its high volume of hard routes and attention, still had one very obvious winter line to do. This was a route I had had my eye on for the last couple of season since I had done “Happy Tyrolean’s” with Mike Tweedley about two years ago. I remember standing on the belay after making the first onsight ascent of the crux pitch of “HT” and looking left to see an awesome hanging corner above a super techy looking steep slab. At the time, I thought that it would be totally outstanding to climb up the steep slab below to gain the corner but didn’t know if it was a route or if it had already been done. 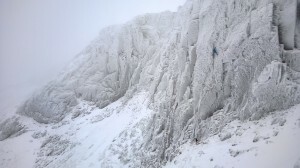 I later found out that the route was the summer line of “The Demon” and that it had in fact never been done in winter. So I decided to keep this in my Lochain arsenal for a later date. So on Saturday this is what Dougie and I did. I lead off up the first pitch, which was OK to start, and then it became apparent that I was going to have to switch on my head a little and get in the, making tricky moves away from marginal gear zone! The climbing was really enjoyable and like most routes on that wall, was super technical for both axes and feet. After some interesting high rock over moves and some powerful pulls, I had gained the steep slab and could see the hanging corner above. I moved up and gained the corner and continued until I was level with the stance that I had been on two years prior when I did “HT”. Having done “Siberian Tiger” (to the left) and “Happy Tyrolean’s” (to the right) I knew that I needed to get onto that belay once again, as there was nowhere really to belay above. So after a bit off upping and downing, I decided to traverse hard right across the blank looking wall to reach the comfort and safety of the ledge. I eventually committed to a super thin pick placement and reached out to hook a very rounded ledge, I then matched the ledge and was expecting my axes to rip any second! I shuffled my feet right and couldn’t believe I was still on the wall, I was now less than a meter from the ledge, but it might as well have been a mile away, the climbing was so teetery and thin that I had to keep my full concentration on my picks and move to another horrendously crappy placements. One more move and I was able to swing into the invitingly springy turf clump that made its home on this even more inviting ledge. Ahhh… much better! I made a belay and proceeded to bring Dougie up the pitch. It was cool to see him enjoying the climbing as much as I did and after a bit of a Tarzan impression on the traverse, he joined me and the comfort of the belay. 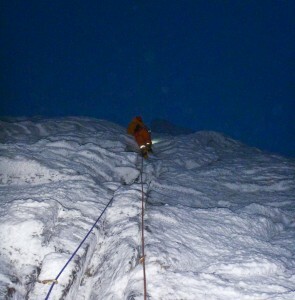 Having messed about with plan A for a bit and having had a pretty leisurely start to the day, It was now starting to get dusky and after Dougie had strapped on his headtorch, he set off up the top pitch. Dougie reaching the corner on pitch one. The forecast was right, and the wind had started to pick up by this point, but despite this, the wind was super warm (also forecast) and I didn’t get too chilly as the darkness rolled in. Dougie got stuck into the climbing, and after not too long he had reached the easier ground and swiftly brought me up to the top. Once back out bags it was obviously getting super warm. 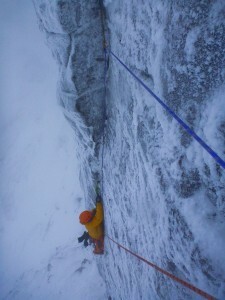 The snow was slushy and descending the slopes back to the base of the coire was a total nightmare due to the snow balling up our crampons after every step. There had been a massive thaw of the lying snow throughout the day and we decided to just head home, rather than stay up and go out again on Sunday. Dougie leading the last pitch. We were both chuffed with the days climbing, and after some Christmas shopping (not so fun!) and an awesome training session on my wall on Sunday, it felt like a pretty productive weekend. Unfortunately having looked at some photos of the coire online today, it looks like it has been totally stripped due to the warm wind. So it’s going to be more training and working for the next week or so. Oh well…. it’s got to get good again at some point, right?